I brought a lot of books back with me to Shanghai after a recent trip to the U.S., most of them things I need to read for my dissertation or review copies sent to me by publishers. But one paperback tucked in my carry-on bag was a book I have no desire to crack open. That’s because I’ve read it so many times—in the pre-writing, writing, and copy-editing stages—I more or less have it memorized. 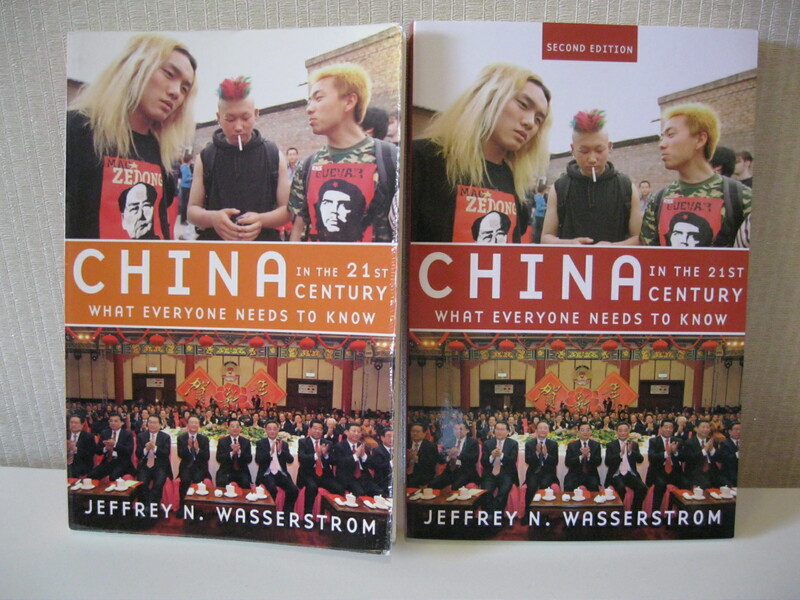 The book I’m talking about is the second edition of Jeff Wasserstrom’s China in the 21st Century: What Everyone Needs to Know, and I contributed to it. The book’s official publication date doesn’t arrive until early July, but Jeff snagged a few advance copies during a visit to the Oxford University Press offices in New York and handed one off to me in late May. Since then, Amazon has started shipping the book, which is also available for Kindle, so it’s officially out in the world. My battered first edition and pristine new copy of the second. Many people have asked us what’s new in the new edition, and how the new parts interact with the material from the first edition. The answer to the second half of the question is that the old and new are woven together seamlessly (we hope). Jeff wrote a separate Author’s Note for the second edition, but otherwise, we simply edited the existing text—deleting, adding, and re-writing—without bracketing off our changes. I know a lot of professors assign the book in survey courses on modern China; the way we approached the second edition means that it wouldn’t work for some students in a class to have the first and some to have the second, since they differ significantly in many places. Some parts of the book are less changed than others. We decided that the cover photos were too good to replace, though we switched the accent color from orange to red. The first three chapters, which are on China’s past, have been tweaked to reflect new scholarship, but they’re relatively intact. And, as Jeff wrote earlier this week at the Dissent magazine website, we didn’t have to make any edits to the question and answer on 1989’s Tiananmen Square protests and subsequent June 4 Massacre, since the Chinese government has made no moves to revise its line on the tragedy. So that’s what’s different (and not) about the second edition of China in the 21st Century: What Everyone Needs to Know. If you find any typos, though, please don’t tell me. That’s one thing I would prefer not to know. Previous Previous post: What’s in Your Water?